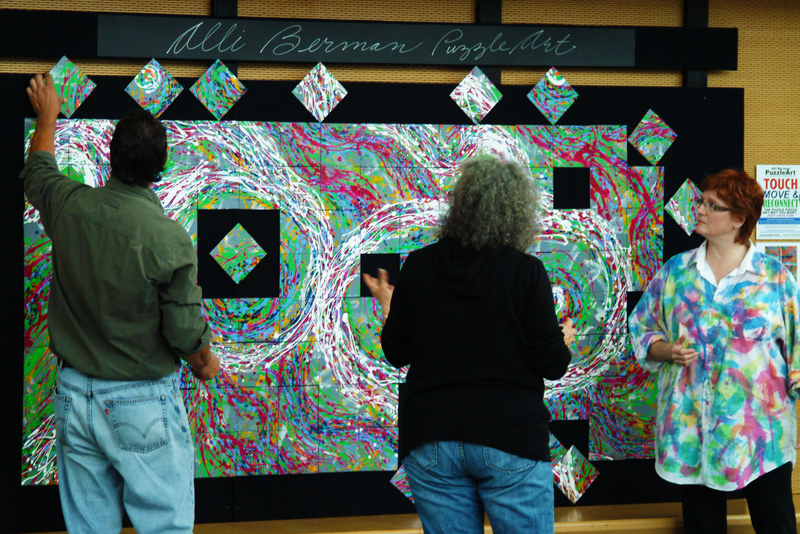 Alli Berman PuzzleArt is an interactive artform enjoyed by kids and adults the world over. Brightly colored and highly textured, PuzzleArt is the complete hands-on experience that engages minds and builds imagination. Individually and/or in groups, people manipulate and organize PuzzleArt pieces into millions of combinations. This process jumpstarts creativity as they learn to think outside the box. Additional benefits of PuzzleArt is it opens a person's eyes to the possibility of other pathways or problem solving perspectives, forges tolerance with smiles amid the Aha! moments, and engenders conversation and community. This unique concept was created by Long Island PuzzleArtist Alli Berman. 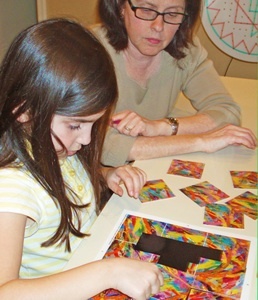 The PuzzleArt Therapy System came out of a collaboration between behavioral optometrist Dr. Susan Fisher and PuzzleArtist Alli Berman. Therapists use the PuzzleArt Therapy System in 15 countries to help kids and adults develop their perceptual, learning and oculomotor skills. Enjoy looking, doing, buying and using. CREATE your best day! If not now…WHEN?! Alli Berman, Tilles Center, Dance of Life-Trails of the Trinity. 128 pieces interactive PuzzleArt. For all ages. PuzzleArt Therapy – THE colorful and fun approach. Improving critical skills through creativity with systems and products that are therapeutic, educational and just plain fun! Used for diagnosis and therapy. Now in 15 countries and optometric schools in the U.S. The PuzzleArt Therapy System and Achieve Success activity books were developed by Susan FIsher, OD and PuzzleArtist Alli Berman. Children increase their success in and out of the classroom. Adults enjoy this colorful way to work on self-improvement. Hello! I cannot find my instructions for an item that I bought thru Bernell of yours! I have Puzzle art Perceptual play card pack. Can I get the directions emailed to drjacee@yahoo.com.